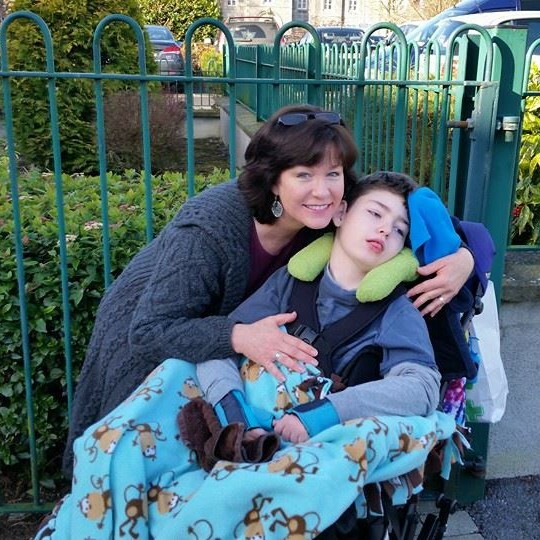 The last two nights my son Brendan Bjorn has been cared for at LauraLynn Children’s Hospice in Dublin. I get 15 nights of respite per year thanks to this wonderful charity. The other 350 nights per year I am on my own, out of luck when it comes to sleep as I need to get up an average of 2 or 3 times each night to attend to my son, and there is no overnight respite available elsewhere. Many people think I’ve had an opportunity to rest the past few days. What they forget is that I have been busy running around Dublin with my other son to give him time alone with me. Yes, of course, it is fantastic to spend this special time alone with him. He needs it and I need it. But guess what? I also need time away on my own…but I cannot get it. I need it. I want it. I can’t have it. I am not recharged, refreshed, or relaxed. The first 3 days of next week, each day has a medical appointment. Back up to Dublin Monday, then Naas on Tuesday and Wednesday. The week after that, I actually have a procedure requiring sedation and I’m scrambling to sort out transportation to and from, and hoping I will get home before the boys return from school. Oh wait, that is if Brendan can continue going to school after next week because his pressure sore is once again becoming tender and red and looks about to break open…again. That means being bedridden…again. That means me being housebound…again…for God only knows how long. I am scared and angry. Last week I received the very unwanted news that Brendan’s scoliosis has drastically increased. Also last week, one of his 3 seizure medications had to be increased because his seizure activity has increased. He still is only urinating once every 24 hours or more yet still is having to wait over 2 months for a simple renal ultrasound to be performed. I am angry. I can’t help but wonder if he was able to talk and tell the doctors what that feels like, would he get the ultrasound done immediately? I bet he would. And if his scoliosis needs surgery, how long will he have to wait? Or, will he even be able to tolerate surgery? He is so fragile and growing more so each passing month, that I know he may not be fit for surgery. I am scared. Back to reality tomorrow? In fact, I never actually escaped reality. It is always, always, heavy on my mind.